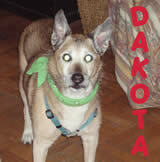 Dakota lived a full life until just short of her 17th birthday. She always had a happy disposition and a wagging tale and a lick for everyone. She loved to play and had a great way of teasing and so proud of herself when she won- she would prance around with her tail up and her head high. Since she was the last dog in my aparmtment building- all the dog lovers and even those who were afraid came to adore her and greet her and she them. She brought joy to the kids who liked to have her lick their hand to the older people who were lonely and she gave then her love and affection. She always waited for me on my bed and looked to me for care but I looked to her for happiness and unconditional love when life doesn’t always offer this up to people. I miss her but know she is running and playing with her tennis balls and sticks and barking at birds. I miss her little feet and her wardrobe of bandanas which I wear now. There was no other dog with more personality, love and kindness in her eyes and now at peace and is very missed.